It's funny how reading haunts us. I'll never forget the day I bought Clive Barker's 'The Great and Secret Show' as a UK first edition hardcover from Forbidden Planet Books. Something about the day itself, overcast LA, verging on rain. The cover image itself, surreal and swirling with iconic figures. It was back then as well, and from the same store that I bought a copy of 'Fear' magazine, a super-glossy, ultra high-budget magazine featuring fiction by Peter F. Hamilton and lots of color everywhere. I no longer have that issue, and I regret it. It seemed to me at the time to herald great things. Too bad it took like, 25 years for Interzone to rise up to that challenge. But, aside from a deliberately, I must presume, cheesy cover, Interzone 230 sets a stellar standard for high-production value, great content speculative fiction that the American digests cannot even dream of. It's not just a magazine full of four-color pages that distinguishes 'Interzone.' Lots of color can be a detriment if the design is not clean and if the content is crap. On both fronts, Interzone makes the right decision, using color as an effective device for the layout and illustration of the fiction and non-fiction. The fiction this time around is relatively strong. For my money, Lavie Tidhar's "The Insurance Agent" is the best piece of fiction herein. Tidhar knows he's writing a short story, and uses the medium effectively to slay the reader with a story of aliens, spiritual entities and the humans who use them. "Perhaps madness is seeing the world in a different light," James Turner, the narrator muses. If that's the case, Tidhar's story offers an effective light source. Tim Lees' "Love and War" which fires off the issue isn't far behind, with a powerfully written and imagined story of invasion. "Age of Miracles, Age of Wonders" is what the author characterizes as "Aztech steampunk," a smart enough label to get a lot of readers behind her novels set in the same milieu. Patrick Samphire's "Camelot" and Nina Allan's "The Upstairs Window" are excellent examples of the nebulous junction where literary fiction and speculative meet and mix it up, and each offers an evocative illustration to propel the narrative. The rest of the magazine is devoted to book reviews, with a few happily unfamiliar titles mixed in among the expected, a smorgasbord of straight-to-DVD movie reviews from the unfortunate Tony Lee — he had to actually watch all that dreck, and of course, the cover story Nick Lowe, who 25 years ago began his movie-reviewing career quite auspiciously with Brazil. It's an indicator of quality. Lowe's reviews in this issue of Interzone are for the most part more entertaining than the movies they cover. The problem with Fear is, of course that it is no longer with us. On the other hand, Interzone has demonstrated (and well-deserved) staying power. I have to add that the advertising, though sparse is generally not annoying or embarrassing. It keeps getting better looking, the content is top-notch, and you'll even find at the beginning of this issue a picture of a somewhat familiar face. It's time travel done right, it is. Interzone continues to be worth your valuable time and money. It would be so nice wouldn't it? One theory to rule them all, one theory to find them; one theory to bring them all and in the darkness bind them. No matter what the arena, be it literature, science, or religion, we always want to boil it down. We want the single answer, and we don't really care if it's 42, the Bible, E=mC2, the Koran, the Flying Spaghetti Monster, or "To Serve Man." Give us a focal point and we can move on and make the decisions that matter — what to make for dinner tonight? And don't you know, we are always on the verge of that fateful answer. We're never quite there yet. The Apocalypse is always around the corner. The Rapture, be it of the Nerds or the Faithful, is always just around the corner. Say thirty years out, max. But it's there, oh we know it's there. It's the Post-Atomic Sales Technique, with which you can win World War Three. Let my PAST become your future! No, Hawking and Mlodinow are not warning us of an impending Apocalypse. Well, not except in the sense of an end to theories, if not theorizing. 'The Grand Design' takes on the much sought-after "Theory of Everything" (which, when I last heard about it, had been solved by a surfer-genius), and offers up what the authors call M-Theory. M-Theory is not one theory, but many. If you're a science fiction reader and familiar with the "multiverse," or a casual reader of popular science on quantum physics and you've fun across the "many universes" concept, then you can simply apply that concept to the theorizing that goes on in the vicinity of "meaning of life" physics. 'The Grand Design' is not a soft-science book. It's a clear, concise look at where we are this moment in our understanding of ... everything, really. Science and the technology that enables us to study the universe have come a long way since Hawking first wrote 'A Brief History of Time.' They address our changing notion of time, and confront religious conceptions of creation with new physics and math, in a manner that is both engaging to read and respectful. Hawking and Mlodinow make the new perception clear by showing us the old perception. Their prose is limpid and compelling, and they know how to structure a chapter in a non-fiction work so that the reader is compelled to read, immersed in the non-fiction reading experience. When you're writing about physics, the ability to make your work readable in this manner is both difficult and critical. 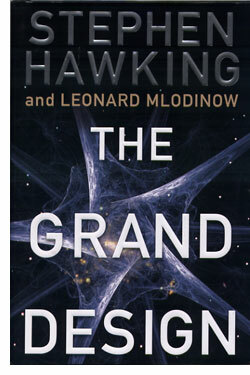 Hawking and Mlodinow know how to write science that seems like science, not popular science. It's the sort of distinction that makes their books important as well as enjoyable. Of course, top-notch production values help as well. From the stunning front cover image to the final page, 'The Grand Design' is in fact grandly designed. Slick, heavy pages and four-color printing show the publishers had the wisdom to spare no expense in bringing this book to its readers. And the investment really pays off. With an even slightly less polished presentation, it's quite possible that some of the information here would have been lost. In fact, that's sort of the point the authors are making. One theory of everything won't do, just as words alone will not convey the message about M-Theory. The theory of everything, it seems, is plural. Sometimes it takes a while to twig to a writer's strengths. And sometimes you won't get that clue from the writing itself. I've been reading Neal Asher from the first edition of his first big novel for Pan Macmillan, 'Gridlinked.' I've enjoyed the hell out of every book I've read. Asher is an utterly dependable and often brilliant writer, who can crank out big books about big monsters, galactic uber-minds, cranky, self-aware machines and even a few mere or near-humans like nobody's business. For all that I've read, for all that I've enjoyed, I've never, until I saw the cover of his latest, 'The Technician' (Tor UK / Pan Macmillan ; August 20, 2010), realized that Asher is in many ways, writing the ultimate Lovecraftian fiction. Pan MacMillan has recently changed artists for Asher's covers. Make no mistake, I've always enjoyed the work of his original artist, from the 'Gridlinked' days, Steve Rawlings. That said, the image created by Jon Sullivan brought to the forefront of my mind something about Asher's writing that had been lurking in the background. That's appropriate really, such time bombs waiting in my personal mental abyss. 'The Technician' is a direct follow up to 'The Line of Polity', taking us back to Masada some twenty years after the events that took place in the first novel. Things have not grown better in the intervening years. Interesting times may be hard on those who have to live through them, but they are thoroughly entertaining to read about. We first meet amphidapt Chanter as he studies the so-called art of the critter we see on the cover of the novel, who is indeed the hooder named "The Technician." It's not just a monster; it's an artist. It creates structure out of the remains of its victims. Of course, The Technician is the least of Masada's present problems. Not insignificant, though. Asher is in top form when he's out spinning alien ecologies and unusual intelligences. Both feature in this novel about war, aftermath and revenge. But it is not just Asher's prodigious imagination that gets a workout here. He's a skilled writer on both the prose level and in terms of creating characters we enjoy reading about. His skill in this regard is easy to overlook, because there's a practically non-stop plot fueled by over-the-top mayhem in progress. Still, when you think about reading Asher's stuff, you realize how much fun it is to be with his characters, no matter what side of the equation of good and evil they are on. Even his most lethal antagonists are so much fun, you have to kind of wonder if evil might have more going for it than we're generally told. 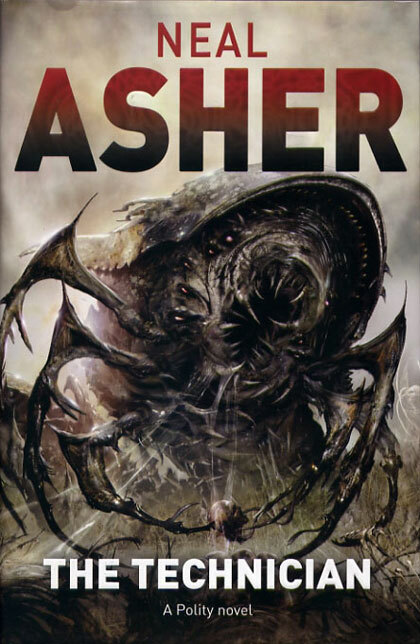 But as you enjoy Asher's latest, let the cover image of the hooder settle in your mind and think back to Lovecraft, and his shoggoths. Like Lovecraft, Asher likes to suggest that there is much more to his critters than the mere physique, though in this case, The Technician does indeed seem to have the feel of something that slithered out of Lovecraft's abyss. It's not just the monsters, though. Asher's haimans, his machine intelligences, the glimpses of those age-old stellar civilizations, all of these are, in the retrospect suggested by the cover of 'The Technician,' quite successful explorations of the Lovecraftian universe — unknowable, deeper and more dangerous than we can imagine. Asher's novels, in the UK at least, benefit from one other perhaps underappreciated strength. If I recall correctly, Asher himself told me that he writes his own dust jacket copy. Whatever the case, the stuff they put in those brief notices is quite cunningly written. Even in the DJ notes, Asher employs Lovecraftian techniques, suggesting rather than telling. He never spoils his own plots (which are so complex that it might be difficult for him to do), and always entices the reader. Of course these little details — the DJ notes, the cover image — are important, in terms of marketing books. Asher's people have proved to be quite adept at this. It's also important to note that if you've not yet read Asher and this sounds like your cuppa, you'll want to start at the beginning with 'Gridlinked.' But in the end, the real thrill here is that Asher delivers one exciting, memorable reading experience after another. Anonymity is its own reward. It allows us to define ourselves. In the safety of being unknown, we can engage life on our own terms, and meet others on theirs. Numbers do not just offer safety, they ensure identity. The words we speak, the moves we make belong to us, and those with whom we choose to share them. In our invisibility, we can shape a life. 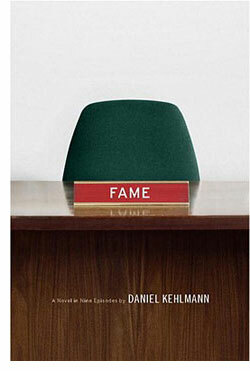 Daniel Kehlmann is a smart and funny writer from Germany who takes us on a tour of the opposite state of being in 'Fame' (Pantheon / Random House ; September 14, 2010 ; $24). It's an unusually structured novel that reads like lightning but stays with you long after you've finished the book. Kehlmann gets under the skin of our public persona by having as much fun as possible imagining a public writ large. When last we met Daniel Kehlmann in translated US fiction, he was 'Measuring the World' with Friedrich Gauss and Alexander von Humboldt. 'Measuring the World' is a funny and entertaining novel that played with novelistic conventions in a manner that translated particularly well. Kehlmann strips out a lot much of what we expect to find in a novel, and what remains is surreal, funny and yet strikingly intense. The result is reminiscent of Chuck Palahniuk or Jennifer Egan in so far that it is sparse, but otherwise there is an inventive, unusual feel that is utterly original. 'Fame' is a novel is nine "episodes" that read rather like short stories but play out over the run of the book to become a novel, or something closely resembling a novel. From the first page, the novel gives us an idea of what the format will be when a computer tech named Ebling buys a cell phone, but finds that his new number is actually that assigned to a movie star named Ralf Tanner. In each story that follows, the narrative moves along like the messages in the game "telephone," when each successive repetition distorts the message more and more. Ralf find his life being taken over by an impersonator, and the man whose mistake caused the problem in the first place watches his life crumble away. Kehlmann is a master of chameleonic prose, but readers of this column and those who haunt the internet in general will find the chapter "A Contribution to the Debate" particularly skewering, in which we meet an anonymous poster to a forum for those who report sightings of the famous who finds himself, "a whole load visible. Very bad feeling and for real." Kehlmann's tale of trolls and flamers reads like a cautionary fairy tale for the 21st century. It's a whole load of fun, brilliantly written in the deathless prose of the Internet. Kehlmann has the prose chops to make this very funny, with a dead-on eye for the sort of writing you find in comment alleyways and on-line forums. What makes this all work so well is the fact that he loves the characters he's writing about, and he loves their style as well. This isn't a takedown of the evil Internet, but rather a glorious and hilarious celebration of fame, anonymity and slippery identity. Once again, Carol Brown Janeway handles the translation, and her work is apparently as brilliant as that of Kehlmann, because 'Fame' reads as if it were written in English. Of course, the subject is universal. It is us. Fame and anonymity are not so different after all, not if you do not know who you are. We define ourselves one word at a time. And the very hardest word to define, it seems is the word "I." Poetry is matter of perspective, a slant, a version of vision in which words provide a light that cannot be found in the natural world. And not surprisingly, poetry cannot be contained or pigeonholed as easily as bookstores might prefer it to be. It's so much easier for shoppers to see the broken lines, the Robert Frost volumes, and know: "This is poetry." But science fiction comes with many of the same provisos. It too is a perspective, a form of writing that offers us an unnatural vision of the natural world. Yes, you can craft science fiction out of prose, or alternately, write poetry with science fictional subjects. But the matter, the atoms of science fiction can also be arranged to look like prose, and appear to cast a natural light on the natural world. Nonetheless, they are still radioactive. 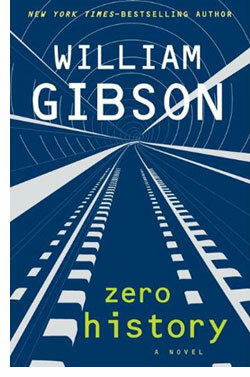 You look at this William Gibson novel, 'Zero History,' and it looks like a regular novel about the regular world. It's not. It is, at an atomic level, science fiction. And that prose is, at an atomic level, not what it appears to be on the page. It glows. It is dangerous and unstable, and liable to undo your tidy vision of the world around you. From the outside, 'Zero History' (Putnam ; September 7, 2010 ; $26.95), is the third in a loose series of novels coalescing around Hubertus Bigend, who first made an appearance in 'Pattern Recognition.' It takes up shortly after 'Spook Country,' when we once again meet Hollis Henry and Milgrim who reluctantly accept employment, such as it is, by Bigend. In the post-'Spook Country' world, everyone's net worth has been at least effectively halved if not erased. The locative art world has been run over by iPhone augmented reality apps, but no matter how much technology you throw at the world, you still need humans to catch as well as pitch it. Bigend, an art historian in the sense that he wants to turn his personal history and that of the world around him into his own work of art, is ever alert to those on the same plane as he is. He turns his focus to a particular subset of fashion, itself of course an expression of change, a wavefront to be shaped for Bigend's profit and amusement. For Bigend, the latter tends to lead to the former, or so he asserts. From the first immersive sentence in this novel to the final swan song, Gibson uses his version of the English language to envelop the reader in a surreal haze of tomorrow's yesterday. This is the present as remembered by the future, the present as seen from the perspective of the past in an imperfect prediction. Language can never capture quotidian reality, and Gibson has no interest in doing so. He exploits the spaces between the words to craft a vision of life between moments of ever-quickening change. In the seemingly-still moments when a man and a woman converse in a café, reality shifts. All this surreal subtlety is quite fine by itself, but Gibson is canny enough to arguably and utterly re-invent the spy thriller in a post-Cold War era. The conflicts that matter, the wars that decimate out world are not so much between countries as between companies. The players are not spy chiefs, secret police and ambassadors, but executives, industrial spies and visionary buyers. In this primarily economic battlefield, Hollis, Milgram and Bigend find themselves pursuing an enemy whose best defense, like Satan, is the fact that nobody is sure he (or she) exists. And even if you take that leap of faith, you must soar over the abyss and try not to stare too long. Internalizing eternity can have negative consequences on the open market. Gibson's vision of the now as a surreal collage of the past and the future is as furiously paced as a battle between competing computer companies. Hollis, Milgrim, and an assortment of wonderfully-wrought characters are compellingly fun to follow in Gibson's personalized version of the English language. As a reading experience, there's a hallucinogenic feel to what is happening, so that danger and beauty become indistinguishable from one another. Does the distinction even matter? So long as you're in Gibson's intense spy narrative, probably not. What Gibson is doing with his latest novel is not so different from what he has always done. He grabs language with the verve of a painter at his easel, writing science fiction at the prose level. The story happens, after all, not in the words themselves so much as the spaces between them. He uses science fiction prose to accomplish the aims of poetry. 'Zero History' is no accidental title. This is a novel that seeks to erase the world around us, and replace it with Gibson's informative linguistic simulacrum. This is a novel that does what the best novels do, and have done since words first found this form. Gibson re-writes this moment. We can open our eyes now. Agony Column Podcast News Report : A 2015 Interview with William T. Vollman : "...a lot of long words that in our language are sentences..."
Agony Column Podcast News Report : A 2015 Interview with Susan Casey : "...the reporting for this book was emotionally difficult at times..."
Agony Column Podcast News Report : A 2015 Interview with Felicia Day : "I think you have to be attention curators for audience in every way." Agony Column Podcast News Report : A 2015 Interview with Robert Repino : "...an even bigger threat. which is us, the humans..."
Agony Column Podcast News Report : A 2015 Interview with Michael Gazzaniga : "We made the first observation and BAM there was the disconnection effect..."
Agony Column Podcast News Report : A 2015 Interview with Neal Stephenson : "...and know that you're never going to se a tree again..."
Agony Column Podcast News Report : A 2015 Interview with Dan Simmons : "...yes, they really did bring those bombs..."
Agony Column Podcast News Report : A 2015 Interview with Jeffrey A. Lieberman, MD : "..its influence to be as hegemonic as it was..."
Agony Column Podcast News Report : A 2015 Interview with Barney Frank : "...while you're trying to change it, don't ignore it..."
Agony Column Podcast News Report : A 2015 Interview with Kazuo Ishiguro : ".... by the time I was writing this novel, the lines between what was fantasy and what was real had blurred for me..."
Agony Column Podcast News Report : A 2015 Interview with Erik Larson : "...said to have been found in the arms of a dead German sailor..."
Agony Column Podcast News Report : A 2014 Interview with Peter Bell : "...I looked up some of the old books..."
Agony Column Podcast News Report : A 2015 Interview with Marc Goodman : "...every physical object around us is being transformed, one way or another, into an information technology..."